The Stories Examined Conflicts of Interest, Secret Fundraising Accounts, Influence And The Judicial Process In Michigan. LANSING — The Michigan Campaign Finance Network (MCFN) works to shine light on the role money plays in Michigan politics and works to tell stories that may otherwise go untold. Our collaborative work has garned a series of journalistic honors in recent years. — In February 2019, an investigative project that was the result of partnership between Bridge Magazine and MCFN won first-place for best Freedom of Information Act (FOIA) story from the Michigan Press Association. The project was an investigation into the state's handling of Enbridge's pipeline in the Straits of Mackinac. The main story was entitled, "Emails Cast Doubt About Michigan’s Ties To Enbridge In Line 5 Debate" and included a large FOIA request. — In December 2018, the Detroit Free Press Editorial Board highlighted a project that MCFN worked on with Bridge Magazine. The report was written by MCFN's executive director, Craig Mauger. It was entited, "Michigan Justices Backed By Opponents Of Redistricting Proposal May Decide Its Fate." The Detroit Free Press Editorial Board included the report on its list of journalism that "made us jealous in 2018." "We'll never know what impact Mauger's reporting had on the two Republican justices who joined Democratic justices in rejecting the lawsuit to stop Prop 2," the newspaper's editorial board wrote. "But Justice Kurtis Wilder, one of three Chamber-backed Republicans who voted to strike the initiative from the ballot, was defeated in his bid for re-election." 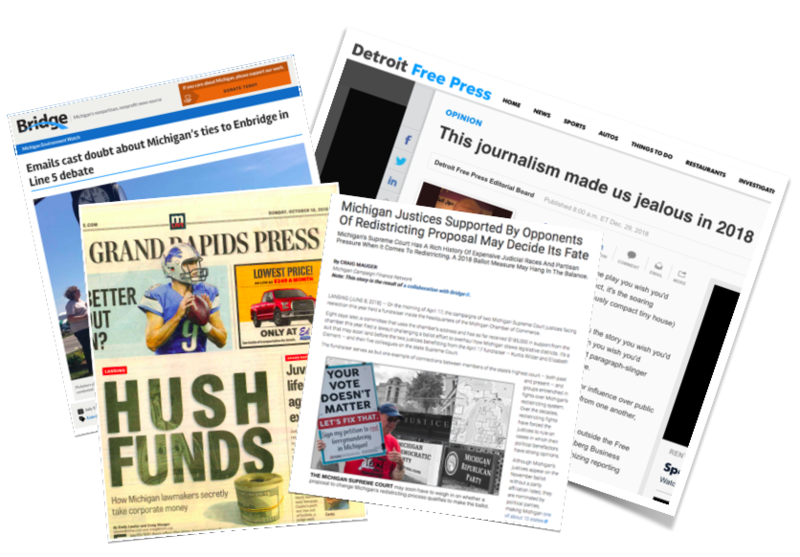 — An October 2016 story called “Hush Funds” — a joint effort of MLive Media Group and MCFN — won a second place honor from the Michigan Associated Press Media Editors (APME) for best investigative reporting among entries from the largest newspapers in Michigan. The project won the award at APME's annual awards banquet on April 30, 2017. The project also received a second-place award for best government/education news reporting from the Michigan Press Association at its annual awards event on May 9, 2018. “Hush Funds” was a story about the widespread use of secretive fundraising accounts that can accept corporate contributions. The story found that at least one in every three Michigan lawmakers in 2016 could be connected to such an account. — On April 19, 2017, the Detroit chapter of the Society of Professional Journalists awarded a second-place prize for best online investigative reporting to a story that was a joint project of Bridge and MCFN. The October 2016 story was called “In Lansing, Where Potentially Self-Serving Votes Run Rampant” and looked at potential conflicts of interests among state legislators and the bills they sponsor. MCFN thanks its board members, media outlets MCFN has partnered with, MCFN readers and MCFN donors for making the projects possible. While awards are nice, MCFN hopes its work leads to a more informed Michigan and a more accountable state government. MCFN, a nonprofit organization, has been supported by family foundations and individuals across the state. To donate to our continued efforts to shine light on the role of money in state politics, click here.